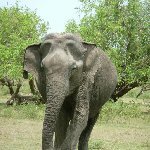 The Yala National Park which is situated near Tissa, also known as Tissamaharama, in the south of Sri Lanka and is a great place to spot wildlife. We start our wildlife adventure in Tissamaharama where we prepared ourselves for the upcoming safari tours through the Yala National Park. 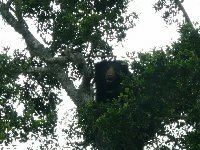 Bear in a tree, Yala.. In Tissa we stayed at the Vikum Lodge, a low budget guesthouse which was perfect for us and even recommended by Lonely Planet as well. We paid about three dollars per person a night which literally included not much more than a bed and a ventilator. In the morning there was no warm water but considering the hot temperatures outside we didn't have a big problem with this and the water was never too cold. 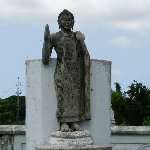 We visited the Buddhist dagoba, or stupa of Tissamaharama and did some sightseeing by foot in the afternoon. We also went to the artificial Tissa Wewa Lake to cool off from the heat and like us a lot of locals did. Most people come to the Tissa Wewa Lake to wash their clothes or to take a bath but we decided to stay on shore. Our trip to the Yala National Park was a true highlight and we were so lucky to be able to spot all kinds of beautiful animals like elephants, foxes, deer, wild pigs, bears, beautiful birds and even a puma! 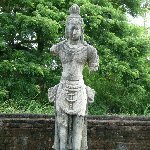 Did you enjoy Pictures of Tissa and Yala National Park and have you been on a holiday in Tissa, Sri Lanka? Where to stay in Tissa: Vikum Lodge is ok if you're planning low budget but don't expect any luxury here. What to do in Tissa: Make sure to do a wildlife safari in the Yala National Park! Liked: The wildlife safari in the Yala National Park was amazing! Disliked: Well, we chose to travel low budget this time around so sometimes there wasn't a lot of comfort but for us it was ok.